"Voyage to the Colonies: Music of the Early Connecticut Settlers," an interdisciplinary project of music, history, and culture, included a series of performances, lectures, and outreach programs, and served to deepen the public's appreciation of Connecticut's cultural history. The initiative was actualized w ith support from the Department of Economic and Community Development, Connecticut Office of the Arts, which also receives support from the National Endowment for the Arts, a federal agency. Connecticut's Early Settlers, click here. live performance of Voyage to the Colonies, click here. 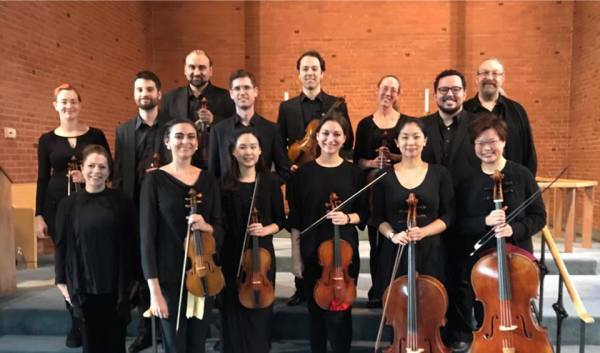 The American Baroque Orchestra following the culminating New Haven performance of "Voyage to the Colonies: Music of the Early Connecticut Settlers"